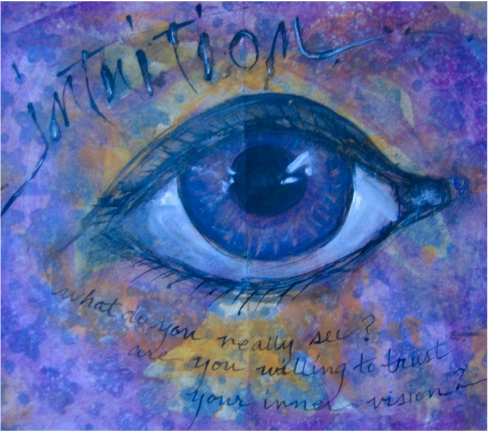 The definition of intuition is the ability to understand something immediately, without the need for conscious reasoning. We all have this capacity whether we are consciously aware of it or not. This process of Creative Inquiry, by its very nature, helps to strengthen our intuitive abilities by tapping into the right side of the brain during our free-form drawing and painting. We can encourage this even more by using this process after doing something that centers and relaxes us, like walking in nature or meditating or using the Body+Mind Resources. Try doing a journal page spread when you are feeling clear and open. Ask your Higher Self a question that you feel uncertain about in your life. See if the process can bring through the Divine Wisdom that you hold deep within you. The more you consciously seek to open to this guidance the more readily available it will become. If you have a spiritual practice or relationship with your Divine Source, try using this process to strengthen that connection. By using the image making and spontaneous writing together you may be surprised by the deep wisdom that comes through.